We went to the RSPB reserve at Titchwell, on the Norfolk coast, recently, thinking we might see bramblings, redpolls, robins, and marsh harriers perhaps. 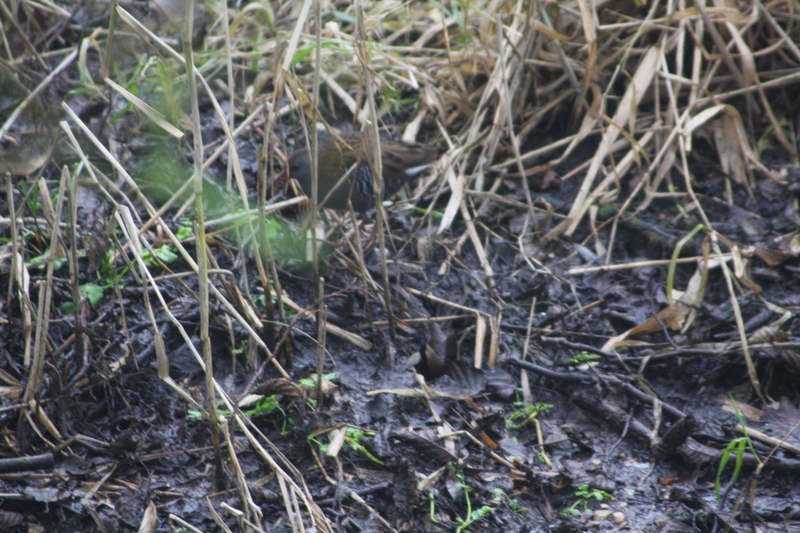 But we found ourselves watching a water rail – or probably two or three – for several minutes. Although the reserve, at about 20 miles away, isn’t really “my patch” I wanted to write about my first sighting of this elusive and uncommon bird. We had just enjoyed a warm snack in the cafe and were having an amble around to see what was about when we noticed a number of people peering into a little stream running alongside a path. Having been told they were looking at a water rail, we eagerly joined them. It took a few moments of staring into the shallow waterway amongst the shade thrown down by overhanging trees, to spot the small, deceptively brownish bird. As I looked at it foraging amongst the mud and tangled vegetation, I began to take in the details of its plumage from the stripy black and white back half of its body underneath a brownish back streaked with black and a long beak, the lower part of which was red. Its legs and toes were long and orangey pink. It appeared quite a bit smaller than its more frequently seen relatives, the moorhen and coot. Like the moorhen, the water rail also showed white feathers under its tail. 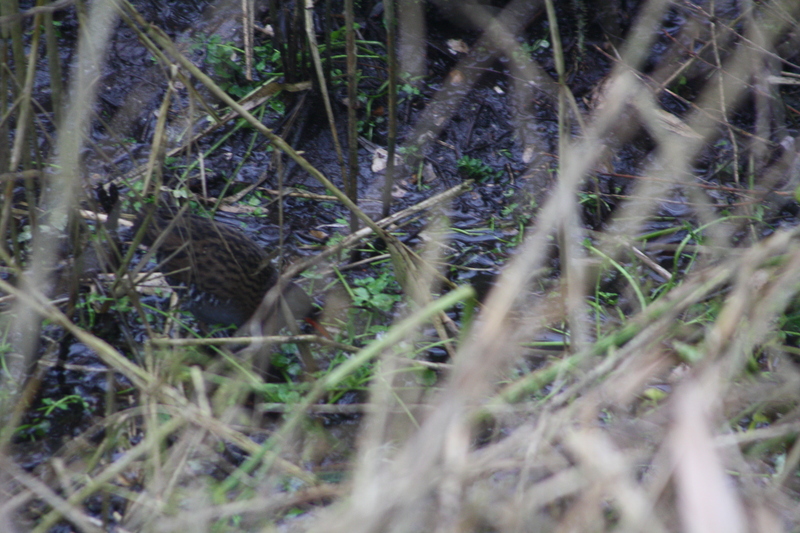 Gradually, the water rail disappeared amongst the vegetation. Indeed, its colouring blended remarkably well with its background, enabling it to disappear very easily indeed. These pictures show how easily the water rails blend in with their surroundings. The pinkish legs and toes are long. We went on to visit one of the hides and strolled around for a while in the unexpected and ever-present grey mist which was heavy enough to produce virtually constant drizzle, and it all seemed rather quiet. I decided I’d like to do a blog post about my exciting new sighting and so went back to the water rail territory to see if it was still there and maybe get a photo to illustrate it. I couldn’t believe my luck when they were still about! I say they because I think I saw one at each end of the stream and also one on the other side of the path. One of the volunteers later told me there were three water rails on site. However, getting a reasonable photo proved more tricky due to the poor light and the ease with which the birds blended in with their surroundings. I’d wondered if I might spook them by standing around trying to take photos, but I guess they’re used to people passing by every day and, indeed, the birds simply continued to search for food. I wasn’t the only one trying to get a souvenir of the experience to take home, either! These birds were real celebrities for the day. Despite their fairly small size and their innocuous appearance, water rails do have a dark side. One of the volunteer guides told us they have been known to take small birds. I believe this supplementing of their usual diet of invertebrates occurs during periods of very harsh weather. At such times, they may feed on carrion, amphibians, fish, and occasionally small birds or mammals. Anyway, great pictures or not, the fact that I’d been able to watch these birds for several minutes was a real treat. 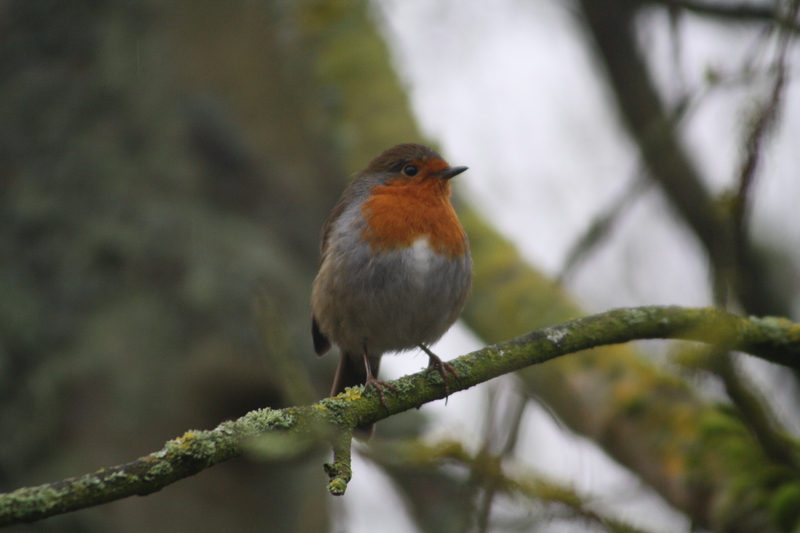 This robin sang to us as we walked round Titchwell. Titchwell rarely fails to produce some delightful moments with robins and on this rather damp Thursday afternoon, there were several sightings, including of one which gave us a little concert from a branch just above our heads. A truly memorable afternoon, despite the mist and murk.